How Washington Turned $38 Billion Into $352 Million : It's All Politics The shutdown showdown was avoided with a last-minute agreement of which it was said it cut $38 billion. But the Congressional Budget Office said the actual net savings will be a fraction of that amount, just $352 million because a lot of the money would have been spent in future years. 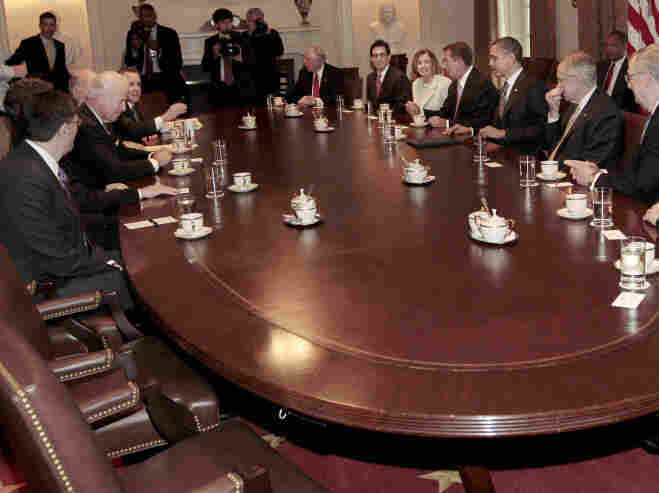 President Obama and Vice President Joe Biden host a bipartisan meeting with congressional leaders. This will be old news to people who closely follow congressional reporting since it was initially reported Wednesday but maybe there are a few people out there who still haven't heard that Washington has taken $38 billion and turned it into $352 million. No, it's not that some federal worker invested in a Ponzi scheme. The $38 billion is the amount of money cut from 2011 federal spending as part of the agreement that averted a government shutdown. Voters will be forgiven if they thought that this meant $38 billion would be saved and applied to reduce the $1.5 trillion deficit. But the non-partisan Congressional Budget Office reported Wednesday that the actual amount of real savings will be more like $352 million. The New York Time reports that it's partly because some of what legislators were counting as savings wasn't actually money that would have been spent this year but in the future though budget rules allowed them to count it. Additionally, some of the savings were offset by contingency war funding. The astonishing result, according to CBO, is the result of several factors: increases in spending included in the deal, especially at the Defense Department; decisions to draw over half of the savings from recissions, cuts to reserve funds, and mandatory-spending programs; and writing off cuts from funding that might never have been spent. Politico's David Rogers, who's been keeping a keen eye on Congress for years, was among the first to report on the incredible shrinking savings. He made perhaps the most relevant point: this was not welcome news for Speaker John Boehner and other House leaders who must deal with many fellow House Republicans, including those affiliated with the Tea Party movement, who were already complaining that the cuts weren't large enough. This can translate into a real political problem for Speaker John Boehner given the "$100 billion cut" rhetoric of the 2010 campaign, the greater influence of tea party conservatives and projections now of a $1.4 trillion-plus deficit. So much so that the Ohio Republican may be forced to borrow a phrase from President Barack Obama and try to sell the deal as an "investment in the future." Boehner's operation disagreed so vehemently with the Politico story, my laptop actually got hotter when their statement hit my inbox Wednesday evening. In this legislation we're dealing with budget authority. Budget authority is how much an agency is allowed to spend on a given program – it is literally the license to spend taxpayer dollars. In Washington terms, "outlays" are how much an agency actually spends over time based on current and prior budget authority. This is what Democrats are referring to: how much these agencies can (and may) spend over the next few months versus how much Congress is cutting from their budgets. And it's misleading. The final agreement cuts nearly $40 billion in budget authority – taking away the Administration's license to spend that money – which will result in deficit savings of $315 billion over the next decade. To summarize, about $40 billion in budget authority was cut. But after the government was brought to the brink of a shutdown, the actual net amount of money to be saved in fiscal 2011 will be around $352 million. It's All Politics covers political news from the nation's capital and its many states, with contributions from the NPR politics team. You can reach the team via our contact form.